Ask any parent about temper tantrums, and you'll likely hear a dearth of stories about unhappy children demanding to get their way in the worst places at the most inconvenient times. It turns out that animal babies aren't so different from their human counterparts. 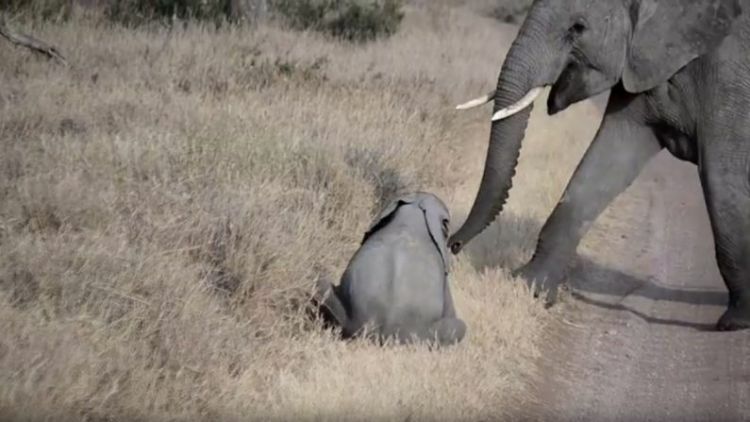 One baby elephant recently decided to throw a fit, and his mother and father handled the situation correctly. This herd of elephants had been traveling long miles to find a watering hole when the baby of the group decided that he'd had enough of walking in the hot sun for hours on end. 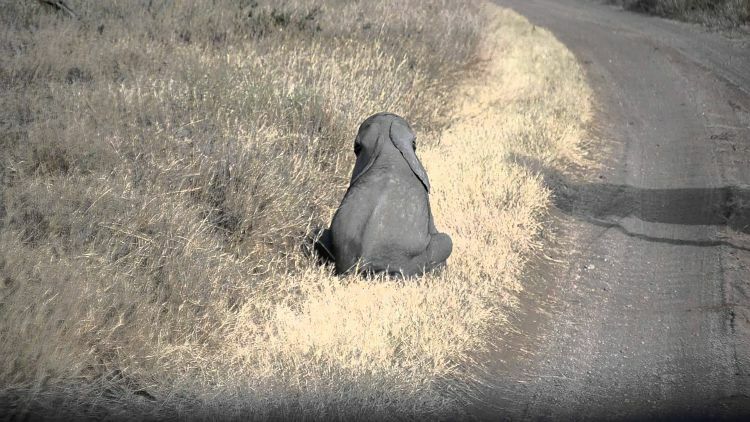 In protest, the baby elephant flopped over in the tall grasses, then sat up partially on the dusty road, stubbornly sat down, and refused to move. The baby's mom walked by as he threw his tantrum and completely ignored him. 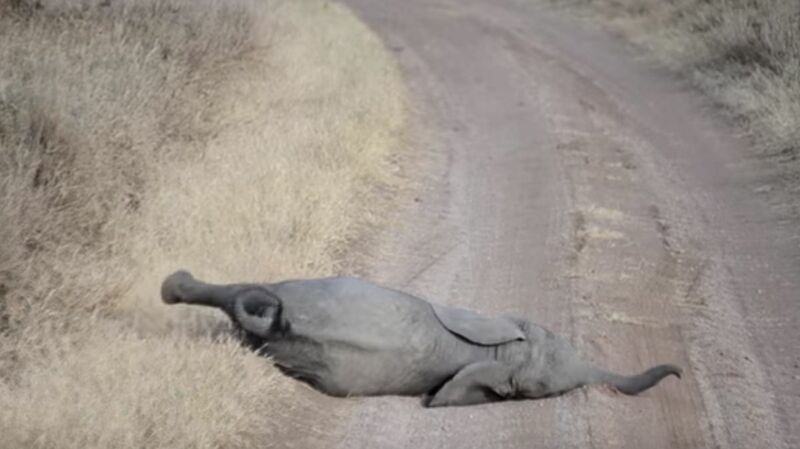 From the baby elephant's perspective, there was still his father to appeal to, so he dramatically fell into the road and rolled around, desperate for attention. Following the mother's lead, the father elephant walked right past his son, not even giving him the time of day. 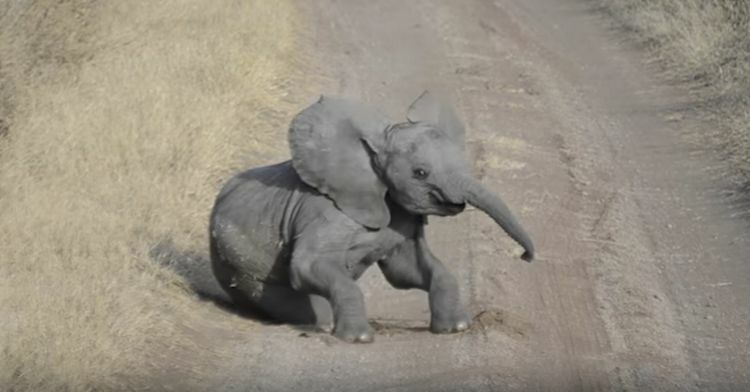 At that point, our little pachyderm friend realized that his antics had no impact on his parents, and he stopped acting up to rejoin his family as they proceeded to continue their quest for a watering hole. 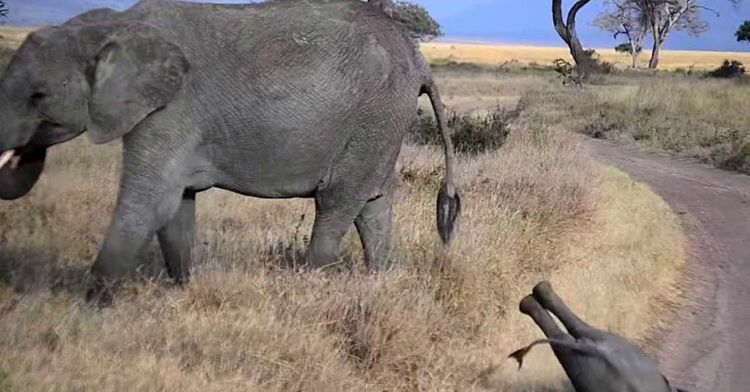 This behavior in elephants is typical, according to the Sheldrick Wildlife Trust, "Elephants also display many of the attributes of humans as well as some of the failings. They share with us a strong sense of family and death, and they feel many of the same emotions. Each one is, of course, like us, a unique individual with its own unique personality. They can be happy or sad, volatile or placid. They display envy, jealousy, throw tantrums and are fiercely competitive, and they can develop hang-ups which are reflected in behavior." Hopefully, the baby elephant has learned to behave better. As for his mom and dad, well, apparently they know how to parent and not engage in their kid's childish behavior! Be sure to share this fascinating and funny video with your friends and family on Facebook.